Beloved wife of Athol. 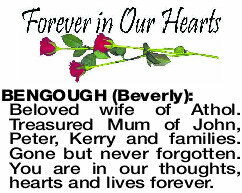 Treasured Mum of John, Peter, Kerry and families. Gone but never forgotten. You are in our thoughts, hearts and lives forever.